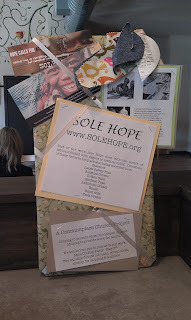 My woman’s group is hosting our first sole hope party. I hope to be posting and updating you on the process. First we sent for a sole hope cutting packet. We then set a date and sent out invitations on facebook. This is what the invitation said. Please copy and use this for your own party. The Woman’s Bible Study group at The Common Place is hosting a shoe cutting party for the group Sole Hope. During the party we will be cutting out shoes that will then be sent to create jobs for shoe makers, and then protect children’s feet from jiggers (parasitic fleas). Are goal is to make 100 pairs of shoes. We are asking each person who attends to donate $10 to go to making the shoes. Please come to the party even if you do not wish to make a donation. We are excited about this event. We hope you can make it. If the day does not work for you please bring supplies or a donation to Avenue 209. There will be boxes set up there in the next couple weeks. Thank you for your prayers for this event. Please invite others and RSVP so we know how many people we will be expecting. We then had one person make a box and another make a board explaining what we are doing. 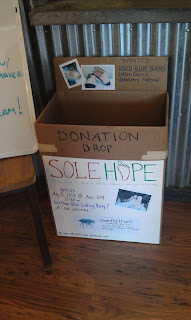 Since we have church in a coffee shop we placed the box there for church people and coffee shop customers to donate materials and learn about the project. The group viewed the video together. The finished products ready to be mailed. And after we shipped everything about a month later we received this great note in the mail.